SAM MicroSound GS fan filter units are ideal for pharmaceutical companies, manufacturers of medical devices and companies in highly regulated industries. 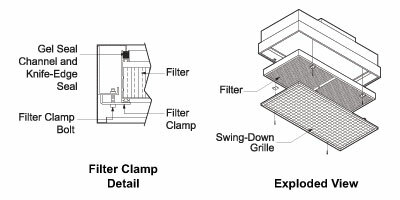 The SAM GS units feature a gel channel on the upstream side of the final filter which provides a leak-free seal between the filter and the housing. SAM MicroSound GS units feature a HEPA or ULPA filter replaceable from roomside while the filter housing remains in place. GS-Style Filter Data: The HEPA Filter is designed for 90 FPM average face velocity @ initial 0.47 w.g. and has a rated efficiency of 99.99% @ 0.3 micron or larger. 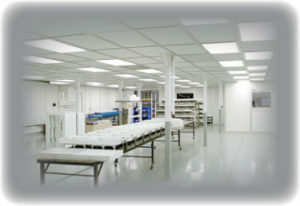 Air Flow: Airflow ranges from 340 to 640 CFM for a 2 x 4 unit and 220 to 340 CFM for a 2 x 2 unit. At 90 FPM, CFM is nominal 510 on a 2 x 4 and 220 on a 2 x 2 unit respectively. Airflow for units running at 50 Hz will be about 20% less.